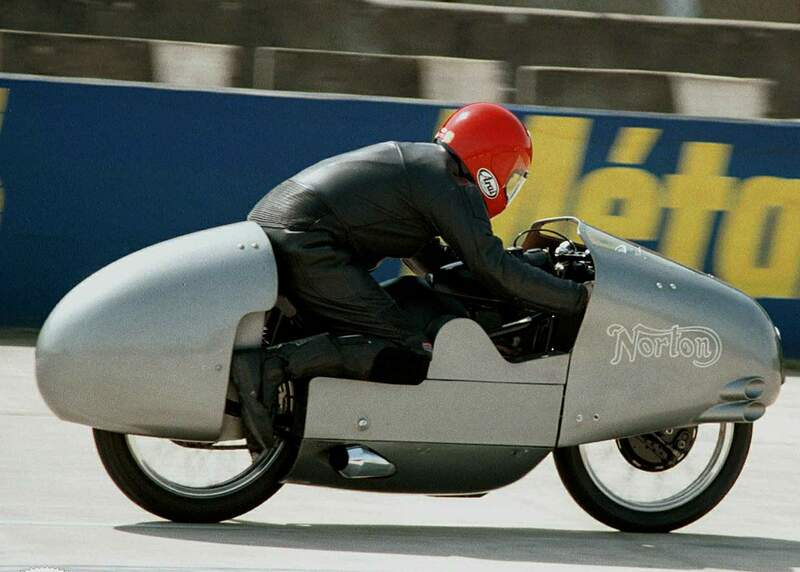 1953 NORTON "KNEELER". 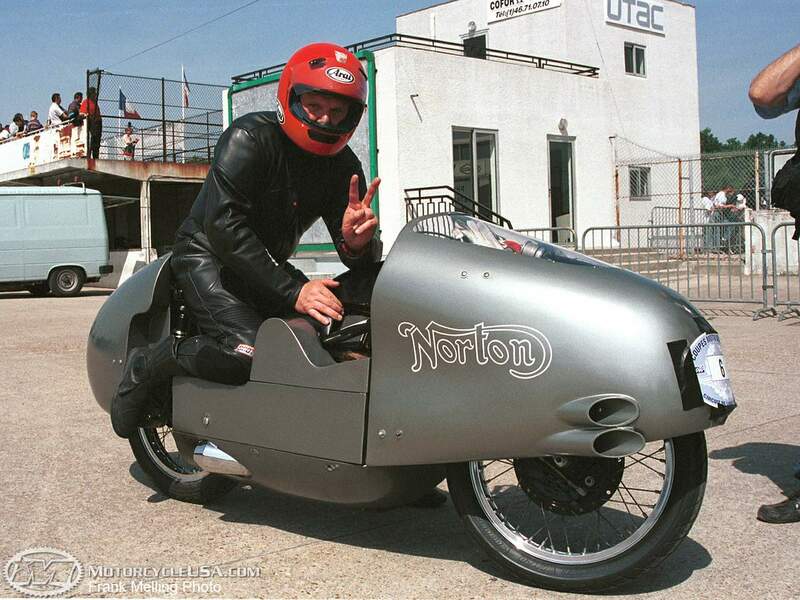 Although Norton's policy throughout their many years of racing has always been to race models more or less the same as the "production racers" they sell, they have tried many experiments which did not subsequently go into oroduction. Most of these were smallish items, but one complete machine stands out clear of the pack as a really revolutionary model—which didn't quite make it. 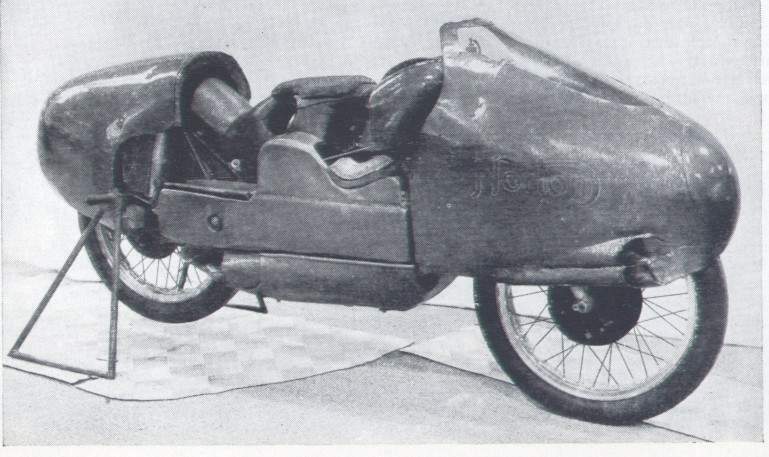 It was the "kneeler"; a machine based on the 350 c.c. "Manx" but embodying complete streamlining, front and rear, and a near-prone riding position. It made its debut in the hands of Ray Amm at the 1953 North West 200 meeting in Ulster where, after a bad start due to a flooding carburetter, he made fastest lap of the race on his second tour, getting into second berth in the process—and then stopped with engine' trouble. 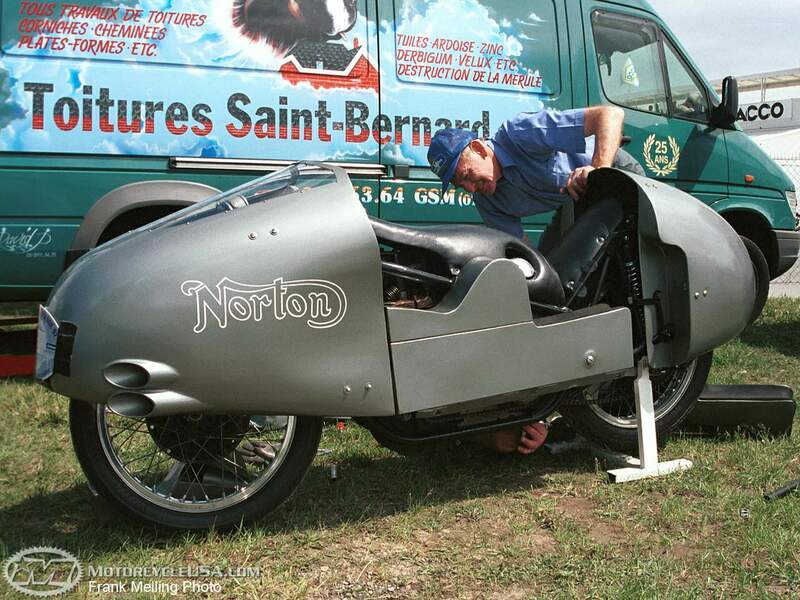 The model appeared fleetingly in the Isle of Man during a practice period but was not raced there. Although the down-tubes and steering head of the frame followed normal "Featherbed" practice, the top-tubes did not, for they were splayed out behind the head to pass on each side of the cylinder-head, mating with the bottom rails just over the swinging-fork pivot. From these points smaller-diameter tubes, braced by others below them, swept upwards and rearwards to form top anchorages for the rear spring units. A variety of other tubes provided a carrying frame for the streamlining and pannier tanks and also mounting points for the gear-change and brake pedals. The low pannier tanks made it necessary to use a pump to raise petrol to the weir-type carburetter. This pump was driven from the inlet camshaft and a similar pump was also fitted to some of the orthodox "Manx" models (to return the overspill from the carburetter, in this case). nose and tail fairings. Forks: "Roadholder" telescopic.